Despite not talking with the Cleveland Browns officially about their opening, New England Patriots offensive coordinator Josh McDaniels says "the book is closed" on interviews for 2019. 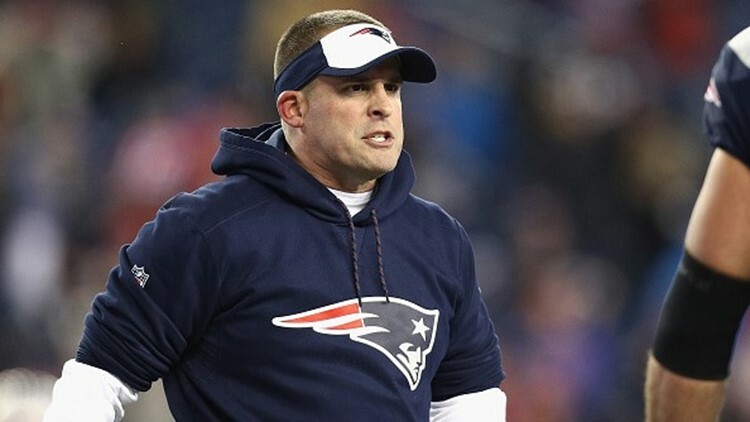 New England Patriots offensive coordinator Josh McDaniels reportedly had a high level of interest in the Cleveland Browns’ head-coaching vacancy, but it appears that potential move is no longer a possibility. In a conference call with the media ahead of this week’s AFC Divisional Playoff game against the Los Angeles Chargers at Gillette Stadium in Foxborough, Massachusetts, McDaniels seemed to shut down the idea of him leaving the Patriots to join the Browns. “The book is closed,” McDaniels said when asked about head-coaching interviews for 2019. “It’s always a humbling experience to have an opportunity to interview with anybody for that position, and I was thankful for the opportunity to meet with Green Bay. 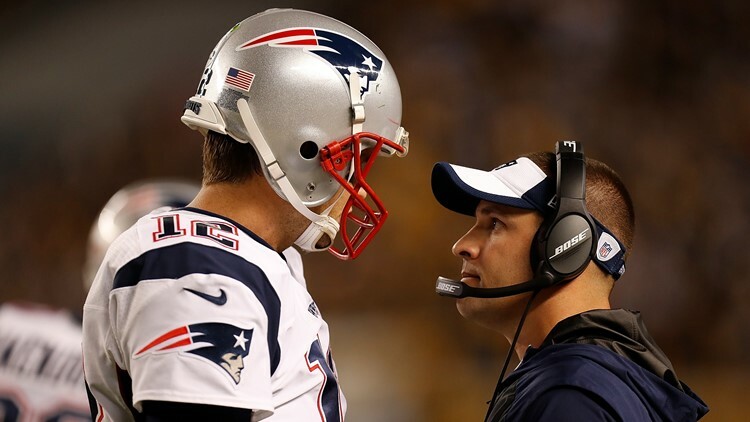 New England Patriots quarterback Tom Brady talks with offensive coordinator Josh McDaniels in the fourth quarter during the game against the Pittsburgh Steelers at Heinz Field in Pittsburgh, Pennsylvania on October 23, 2016. McDaniels was considered a betting favorite to take over as Browns head coach and has ties to the Northeast Ohio community. McDaniels was born in the Akron suburb of Barberton and went to Canton McKinley High School, where he played for his father, Thom, a well-respected and very successful prep coach. Then, McDaniels went to John Carroll University in University Heights, where he played wide receiver alongside 2019 College Football Hall of Fame Inductee London Fletcher, as well as Chargers GM Tom Telesco and Notre Dame special-teams coordinator Brian Polian. Last offseason, McDaniels agreed to become head coach of the Indianapolis Colts, only to walk away from the job the same day in order to return to the Patriots as offensive coordinator. New England Patriots offensive coordinator Josh McDaniels looks on prior to the AFC Divisional Playoff Game against the Houston Texans at Gillette Stadium in Foxboro, Massachusetts on January 14, 2017. McDaniels remained well thought of in coaching circles and was a candidate whom several teams requested interviews with in the past despite a limited amount of success in two years as head coach of the Denver Broncos. McDaniels posted an 11-17 record and was dismissed with four games remaining in the 2010 season. McDaniels posted an 8-8 mark with a second-place finish in the AFC West in 2009. Although McDaniels had some success with the Broncos in his first season, his tenure was not without controversy. McDaniels and the Broncos were fined $50,000 each and assistant Steve Scarnecchia was fired for illegally filming a San Francisco 49ers walk-through practice ahead of an NFL International Series game at Wembley Stadium in London. New England Patriots coordinator Josh McDaniels celebrates during the Super Bowl victory parade in Boston, Massachusetts on February 7, 2017. After serving a graduate assistantship at Michigan State University in 1999, McDaniels joined the Patriots as a personnel assistant (2001) and moved on to defensive assistant (2002-2003) before being elevated to quarterbacks coach in 2004. Ahead of the 2005 season, McDaniels was named offensive coordinator and quarterbacks coach for the Patriots, a position he held for four years before becoming coach of the Broncos. Following his dismissal in Denver, McDaniels became the offensive coordinator and quarterbacks coach for the St. Louis Rams in 2011 before returning to the Patriots in 2012. McDaniels has remained the offensive coordinator and quarterbacks coach for the Patriots for the last seven years. 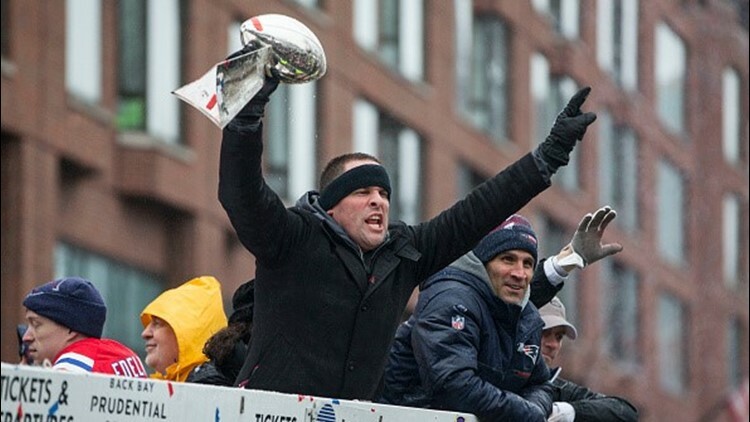 During his time with the Patriots, McDaniels has been a part of five Super Bowl-winning teams. Although the Browns never requested to talk with McDaniels about their opening, they have been thorough with the interview process. 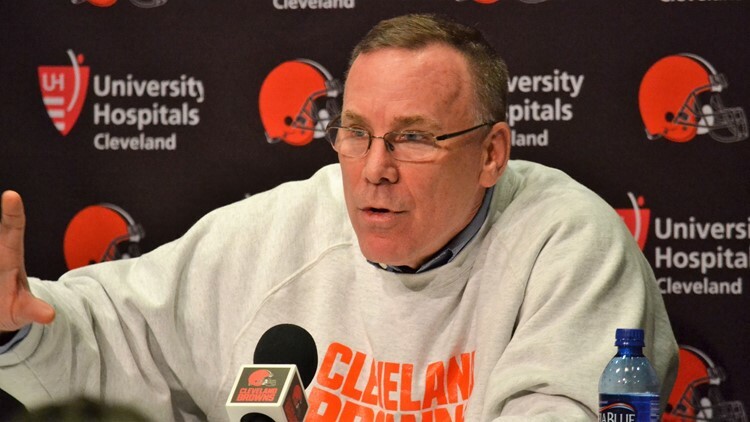 Interim offensive coordinator Freddie Kitchens was seventh interview candidate confirmed by the Browns since starting their search last Tuesday. Last week, the Browns brought in interim coach/defensive coordinator Gregg Williams, Jim Caldwell, the former coach of the Indianapolis Colts and Detroit Lions, current Minnesota Vikings interim offensive coordinator Kevin Stefanski and New Orleans Saints assistant head coach Dan Campbell for interviews. Also, over the weekend, the Browns brought in Patriots defensive assistant Brian Flores (Saturday) and Colts defensive coordinator Matt Eberflus (Sunday) for interviews. Kitchens was interviewed on Monday.